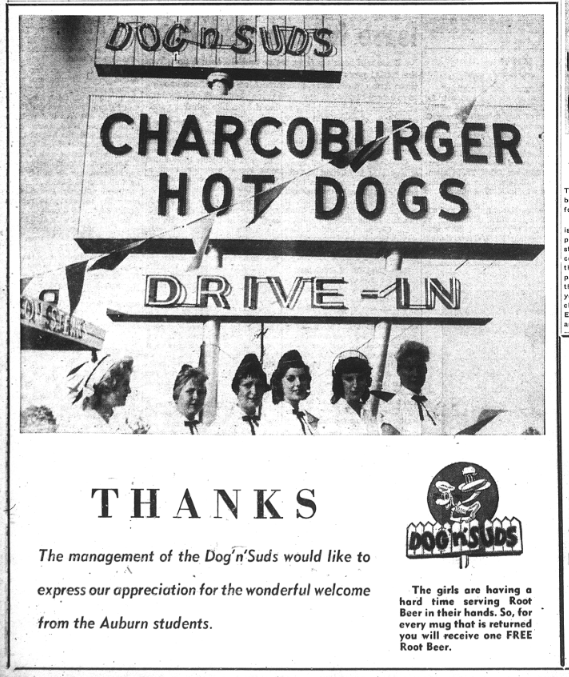 So there’s apparently some Midwestern fast food chain called Dog ‘n Suds that once upon a time came southeastern, to the Loveliest Village on the Plains. And the young people there welcomed the yankees with open mouths. And sticky fingers. Looks like Auburn students may have drunk the place out of business—and out of the South, at least mostly. The southernmost of the 17 remaining Dog ‘n Suds locations is in Paragould, Ark. Related: Of Hamburgers and Hell Raising: Auburn students vandalize Jack’s restaurant to protest location, Crimson-ish colors. So… who knows where it was located?